Summer break is almost over, and the cool, crisp days of fall are about to come in their place. What are you going to do for your last hurrah before you have to hit the books and put your nose to the grindstone? Simple! Rent a charter bus from Professional Charter Services, gather up your friends, and take yourselves off to some epic destination. Here are our top reasons why this is a great idea for your summer break. 1. You’ll make awesome memories together. Summer only happens once a year, but what you do with it is the real aspect that makes it memorable. Are you really going to sit around and let the beautiful summer days pass by you with nothing to show for them? It’s easy, affordable, and fun to take a journey from San Francisco. The more people you can get to go with you, the more fun you’ll have. Whether you take an epic camping trip to one of California’s national parks or a day trip to Disney, you’ll absolutely love looking back on the memories you forge with your friends. Don’t forget to take lots of photos and assign the crafty people in your group the job of creating a scrapbook or a photo book afterward. 2. You’ll break out of the same old routine. If your summer has just started to feel the same as every other summer, it’s time to leave behind the same-old, same-old lifestyle. We bet that you’ve never done anything like this in the summer before, but just because you’ve never thought of it doesn’t mean you shouldn’t spring for the idea. 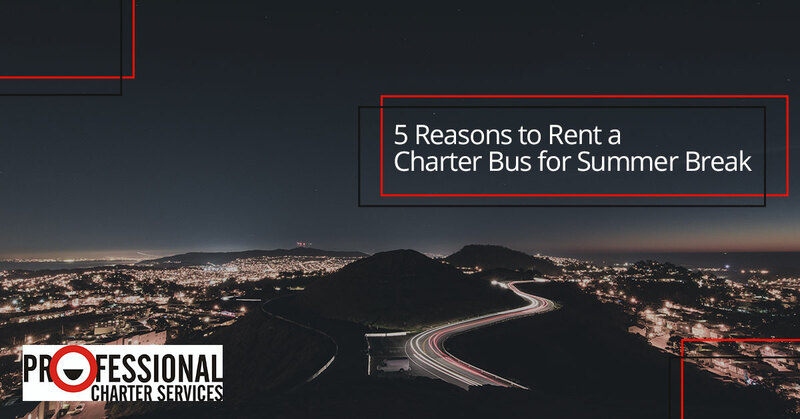 There’s a first time for everything, and when you find out how easy it is to rent a charter bus in San Francisco, you’ll want to do it again for fall break and spring break and pick a different destination each time. 3. Your friends will think you’re super sophisticated. 4. It’ll bring you together as friends. If a road trip is a good way to bring friends together, how much more would a road trip on a charter bus unite you and your friends and build lifelong, lasting memories? Whether you entertain yourselves with card games or other road trip games on the way, you’ll all be able to enjoy each other’s company, laugh, and have a tremendous time, both at the destination and on your way there and back. 5. You might even make money. Set up a facebook event, invite all your friends, and charge them a fee to cover the expenses of this epic journey that they won’t want to miss. How do you make money on this? Simply calculate the cost of the charter bus, divide it by the number of people who can come, and round up the number with a bit of padding. Hey, you deserve it for being the person who is organizing the trip. Plus, it’s a good idea to pad the trip expenses just a bit in case someone has to cancel at the last minute. No matter what your idea of fun and entertainment, there’s a destination in California that you can probably drive to in one day that can deliver the experience you’re looking for. When you need transportation for a group from San Francisco, simply contact Professional Charter Services for a ride. We are here to serve you, so contact us today!